Westminster Presbyterian Church: Greenwood, MS > Acts: The Church on Fire! The book of Acts isn’t about the acts of the apostles; rather, it’s the acts of the risen Jesus. When Jesus ascended to heaven, he ascended in power and authority, and then Jesus sent his power to his followers through the Holy Spirit. The book of Acts is the physician Luke's description of the astonishing things that happened when the Spirit came. Acts chronicles the unfolding of the Spirit’s power in the lives of individuals and in the church as the gospel spread throughout the world. The book of Acts is what it looks like when the fire comes. 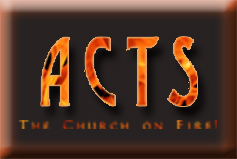 The book of Acts is about the Church on fire!